20 Resource FilesIncluding Ready-To-Use News Releases, Production Techniques, DVD cover examples and much more. Get these three related items to help launch your Video Biography Business! Have you ever wished you had a video of your grandparents or older family members? I know how much it would have meant to me to have one! I can’t tell you how many people have told me that one of their fondest wishes was that they had video footage of their parents and grandchildren to show their kids. While none of us can change the past, a producer friend of mine was inspired to start shooting and recording video histories for others on a pro bono basis. And from there, his hobby turned into a business. And what a business it is today! Family history videos and video biographies can be just as fascinating as A&E’s Biography program. And like that popular TV show you can produce these programs on a smaller basis, incorporating photos, home movies, historical footage -and much more. These extras certainly tell a better life story than a stand-alone interview. What’s more, these videos are a whole lot easier and more fun to create than shooting weddings. Unlike live event documentation and production, this is a no-pressure business. These documentaries go by various names, including video biography, video history, legacy video, heirloom video, family history films. Regardless of what you call them, they all refer to the same thing – a video interview or interviews that may include photos, home movies and more. It’s documentary filmmaking at its best…and most personal! These videos sell easily… and pay well. One of the primary motivations for people to buy these creative products is as a gift or legacy to family members, grandchildren or future generations. Who wouldn’t want their family history to live on? This is one of the key factors that helps make them easy to sell. The key to making a video biography business profitable is to aim for upscale clients. Why produce dozens of $1,000 or $1,500 videos when you could produce a few $5,000 and $10,000 videos? Some video biographies go for as much as $15,000 -or more! To help you make this happen, our exciting new resource includes an extensive marketing section that shows you, step by step, exactly how to market this service to a wealthy clientele and appeal to their hot buttons. What do these people want anyway? Like everyone, they want to be immortal, but that doesn’t work. So the next best thing is to pass their legacy and their story on to their children and their children’s children. What better legacy than to tell future generations the details of their life and family history, not in a long letter, but in a video? And remember -these are more than just video interviews. Your documentaries can weave a rich story by adding family photos, home movies, historical footage, newspaper and magazine articles, trophies -lots more, too. Anything that helps tell the story is fair game, here. “Hi Hal! I am a faithful client of VideoUniversity. Following your advice and your course I have started a successful video biography/family legacy films business. Imagine what a video of grandparents would mean to your clients when they are gone. We’re talking about a serious gift – a legacy. By providing this service, you’re helping families pass on their history to later generations. So not only can this be a profitable business with practically no additional investment beyond the camera and editing gear you already have, but it can also be an uncommonly satisfying, fun business. In the Video Biography Business Kit, we’ll reveal a great trick that will help you jumpstart your business from scratch! Of course, you’ll need to work the conventional marketing techniques any good business does, but we’ll show you a great technique you can use instantly to lead to a lot of good business -quickly! And the really great thing about this technique is that costs you less than $5. 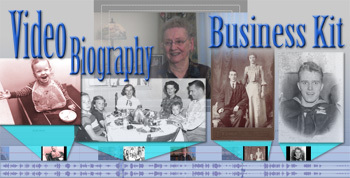 The Video Biography Business Kit will teach you the insider techniques of a profitable new service you can offer to help keep family stories alive and interesting for generations to come! Speaking of dollars, I don’t want you to stick your neck out and simply trust what I’m saying. Try the techniques for yourself. You be the judge. If you don’t agree that our techniques will help you build a successful and interesting video biography business, I’ll give you a full refund within 90 days, no questions asked.